Alonso's father built him a kart when he was only two years old but it was not until he was 13 that he was able to do any serious racing. He won the Spanish cadet national kart title in 1994. Two years later he won the World Junior Karting title and he continued in karts until 1999 when he moved into car racing in the Nissan Open series in Spain, driving for former F1 driver Adrian Campos's team. He won the title at his first attempt and then moved into Formula 3000 with backing from Telefonica. He raced for Team Astromega and won the Spa race and finished fourth in the series. He was signed to a management contract by Flavio Briatore and as a result was soon named as a Minardi test driver and in 2001 became the number one driver for the team, which had just been bought by Australia's Paul Stoddart. After an impressive first season Alonso took the decision to become the Renault test driver in 2002, in the knowledge that he would graduate to the race team in 2003. He joined Renault as expected and with the impressive R23 was able to well and won his first victory in Hungary in August. Life was rather more difficult in 2004 but in 2005 he was a strong challenger early in the season and then settled back to defend a World Championship lead. He did this with much maturity and as a result won the World Championship, becoming the youngest ever F1 title winner. Within a couple of months, however, it was announced that he would be moving to McLaren in 2007. Despite this Alonso stayed on at Renault in 2006 and won the world title for a second time. The move to McLaren did not prove a success. Alonso quickly found himself overshadowed by a new kid on the block, Lewis Hamilton, his own teammate. Alonso was furious because McLaren refused to make him the number one driver, something he believed he was entitled to as a two-time world champion with a rookie teammate. Alonso's relationship with team boss Ron Dennis deteriorated quickly. Furthermore Alonso was implicated in a spy scandal when it was revealed that Ferrari technical information had been leaked to McLaren. Four wins were not enough to get the championship for Alonso. He and Hamilton each ended up with 109 points, one shy of the 110 scored by champion Kimi Raikkonen. Although he had a three-year contract, there was no way Alonso was going to stay with McLaren so he returned to Renault for the 2008 and 2009 seasons. He was heading for Ferrari, so these were two years of treading water. The Renault was not competitive for much of the 2008 season, but the car was quick in Singapore. That led to the sordid affair where the team told Alonso's teammate Nelson Piquet Jr. to deliberately crash in order to bring out the safety car at just the right time to aid Alonso's pit strategy and allow him to win the race. After winning in Singapore, Alonso won in Japan on merit and took a second place in Brazil. He placed fifth in the championship. It was not until August of the following year that the race fixing scandal emerged. Alonso was officially absolved, but team boss Flavio Briatore and executive director of engineering Pat Symonds were fired, and later the FIA banned both men from motor racing for a period. In 2009, Alonso's best finish was a solitary third, and he only placed in the points on seven other occasions. He ended up ninth in the championship, his worst ever championship position since he was sixth in 2003. After Ferrari bought out Raikkonen's contract, the path was finally clear for Alonso to join the Italian team in 2010. Just as he did at Renault [and failed to do at McLaren] he rallied Ferrari around him. Alonso won the opening race in Bahrain. In the next race, in Australia, he was livid when Ferrari didn't tell his teammate Felipe Massa to give way. After that race, Ferrari agreed that Alonso would be the number one driver, but team orders were not needed until the German Grand Prix when Massa was told to let Alonso go through to take the win. 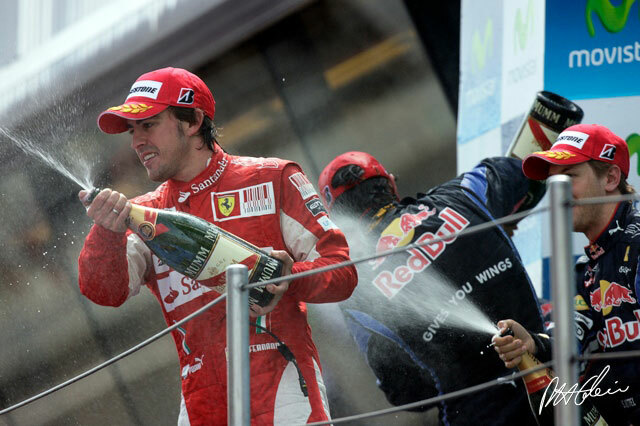 Two weeks earlier, at the British Grand Prix, Alonso had astounded many by saying Ferrari would win the championship. And since that race, the upgraded Ferrari F10 was clearly faster than it had been in the first half of the season. He won in Italy, Singapore and Korea and led the points going into the season finale in Abu Dhabi. But Alonso lost the championship after Ferrari bungled its strategy and had him pit too early, thus bogging him down in traffic. Alonso's five wins in 2010 raised his total to 26, moving him ahead of Juan Manuel Fangio , Jim Clark  and Niki Lauda  and putting him sixth on the all-time win list behind Jackie Stewart . The Spaniard remained at Ferrari through the 2014 season. He had only one win in 2011, but three in 2012 and two in 2013, bringing his victory total to 32. He remained a factor in the world championship hunt as well, finishing in the runner-up position in 2012 and 2013. But 2014 was frustrating for Alonso. He didn't win a race, had just two podiums, and ended up a distant sixth in the points. The relationship between Ferrari and Alonso was coming to an end and in November they announced they would split. Ferrari signed Sebastian Vettel, and Alonso returned to McLaren on a three-year contract. McLaren was also returning to Honda power, but things got off to a slow and unreliable start in 2015 with the new power unit. Then Alonso crashed in preseason testing in Barcelona and had to skip the Australian Grand Prix because of a concussion. He returned for the Malaysian Grand Prix but faced a frustrating season because of the Honda. Alonso did not even finish in the points until the midseason, and tenth in Britain and fifth in Hungary would be his only top-ten placings for the year. Things improved in 2016 when he had nine top-ten finishes including two fifths and wound up tenth in the championship. But Honda took a step backwards in 2017. Alonso, at the very top of his game, continued to support the team but said he wanted to be in a winning car for 2018. In 2017 Alonso became the first current F1 driver in years to compete in the Indianapolis 500. He drove a Honda-powered car for Andretti Autosport in the 500 where he qualified fifth. He was competitive in the race, led for 27 laps, but then retired with engine woes. He was named Rookie of the Year.